Over the years, we have invested strongly in industry organizations, certifications, and training. We’ve soaked up knowledge from industry experts and networked with our peers across the country. While you may enjoy reading ‘People Magazine’ or the latest ‘Sports Illustrated,’ we get excited when the latest copy of ‘Remodeling Magazine’ or ‘Professional Remodeler’ arrives in our mailbox! We say all this just to emphasize that we take our business seriously. When you look at the Affiliations & Certifications below – here’s what they mean to YOU – our client. You can be confident that we know about the latest products on the market. We are tightly networked with local and national suppliers to deliver you the best materials and service. Know that while we are tearing up your home and beautifully putting it back together (i.e. remodeling!) we take the Safety & Health of your home and family seriously. The Affiliations below represent our dedication to being the most prepared, professional and knowledgeable remodeler in the greater Kalamazoo area. Why we are members: Our industry is constantly changing: Rules, regulations, new products, changing homeowner demands. 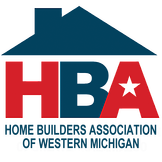 Our membership in the NAHB allows us to stay in front of all of these things and helps us to continually improve to best serve the needs of our clients.